Ski Boot Fitting Inc. Our Sister Shop in Vail Co! The Masterfit University faculty are the best in the buisness having trained thousands of ski bot technicians over the past 20 years! Our top trainers personally teach each session to ensure you get the best education possible! This is a spider to the web from a bunch of professional die-hard ski industry guys that are trying to make a difference!! Good stuff. Check out John Hall's site. He is a song writer gone ski instructor! !You will most likely know of him as a member of the band Orleans. Long time ski tester ,presently a Contributing Editor for Inside Tracks.To get the unbiased truth about modern ski equipment check his site out! http://www.firsttracksonline.com A really nice site , on line magazine, that is very comprehensive. Everything from snow conditions, gossip and equipment tests. Totally honest and made in Vermont!!! 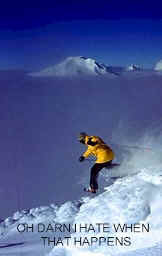 http://www.psia-e.org Professional Ski Instructors of America - Eastern Division. Without these people and their counterparts in other divisions across America modern skiing would not be able to develop to what it is today. TAKE A LESSON! www.theBOOSTERstrap.com Give Ray a shout for information about this boot add on. The single best performance enhancer for your ski or snow board boots. Get the tongue close to the leg and instantly stand taller. Give Gus and the gang a call for the snowcat skiing of your life. Not the Chugash but Central Oregon at it's best. Neil, Mark, and Oz know this 6,000 acres better than anyone.As a matter of fact they have the only commercial permit for the place. A must due before it gets popular. Call Gus for the details. Kirk DeVoll has survived the 70's and 80's and sort of remembers those years!For a great time go on a photo shoot with him in Central Oregon. He knows where to go.He is the official staff photographer for Mount Bailey Snowcat Skiing. Skiing is believing!